Wi-Fi telephony is the latest, most cost effective, and clearest way of carrying voice data wirelessly. The great news is that it can be integrated seamlessly into the same infrastructures as currently used for computer and telephone data.The digital quality is far above current cellular technologies. This book will be among the first to discuss Session Initiation Protocol (SIP), Quality of Service (QoS), and interoperability in connection with Wi-Fi telephony. Security challenges are also presented and solved along these malleable wireless boundaries. 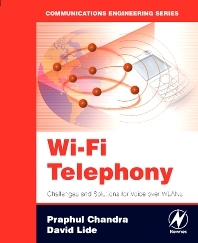 In short, this book provides all the information necessary for effective, reliable, crystal clear Wi-Fi telephony service and implementation. David A. Lide currently is a Senior Member of the Technical Staff at Texas Instruments and has worked on various aspects of Voice over IP for the past nine years. Prior to that, he has worked on Cable Modem design and on weather satellite ground systems. He lives with his family in Rockville, Maryland.